Funk, funky, and funkiness are terms employed so glibly when enumerating and evaluating the elements that have enriched jazz that it’s worth calling on Webster’s Dictionary to define them. Funk, it states, combines elements of R&B and soul and is characterised by a percussive vocal style, static harmonies, and a strong bass line with heavy downbeats. Trombonist Dennis Rollins, whose capitalised new band is called FUNKY-FUNK! would endorse that. As a supreme technician, apart from anything else, he would also approve the supplementary information offered by the American musician, academic and educator John S. Davis, to the effect that funk relies on straight quarter notes and rhythms syncopated to 16th-note level, and that brass and saxophones are employed to add background support. Rollins, who was invested with the MBE in the Queen’s birthday honours list last year for services to music, is also an educator, possibly because he benefited from jazz schooling as a young man in his home town of Doncaster. He’s an honorary freeman of the borough. “I owe a lot to Doncaster Youth Jazz Association and my teacher John Ellis MBE”, he told me. 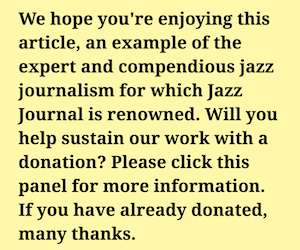 “It enabled me to progress as a performer and to hone my skills as a jazz improviser. As an adult, my role changed to educator and role model to many up-and-coming musicians”. That means he’s been returning the favours. “My work with the Doncaster Children’s Services was a way of engaging with the region’s disaffected youth by giving it a voice through hip-hop, song-writing and music construction”. The off-loading of Rollins’s experience and ability continues with his support of Addictive TV and its Orchestra of Samples project. “I’m always intrigued by the way people use technology in improvisation. Orchestra of Samples performs live mash-ups of music and video production simultaneously, spinning live instrumentalists into the mix. It gives me a chance to perform with my own special effects: rig, harmonisers, wah, delays, octave pedals, and much more”. It also brings him closer to people who want to play. His funkytrombone.com is an online resource aimed at the art of playing trombone in a funky style. It includes lesson plans, video play-alongs and constructive technical advice. Rollins’s parents came over as part of the so-called Windrush generation, but there was no music in his background apart from the reggae LPs they used to play. That provided him with a history of a people in the music of mento and ska. “Many of the performances were infused with jazz flavours”, Rollins said. “Today I hark back to those recordings with a fondness, and when performing I’m able to draw on the familiarity”. The mix attracted much attention: in 2006 his Badbone and Co. ensemble won the Best Band title at the BBC Jazz Awards; the following year in the same awards and the Ronnie Scott Jazz Awards, he was voted trombonist of the year. His Velocity Trio (Badbone no longer exists) won the 2012 Jazz Yorkshire award. As a bandleader Rollins is unusual. In many ways it’s a big ask for a trombonist to front a combo, though the heavier funk element makes it easier. That said, he took a break in 2007 from running bands, joining one led by someone else – Maceo Parker. “With him I learned about nuances of funk and the onstage running of a group of musicians”, he said. “I came back and put together the Velocity Trio as a change from funk and in order to challenge myself as a jazz trombonist. Two albums later, I decided on a new project, and so FUNKY-FUNK! was born. It was back to the kind of “groove ensemble” he’d temporarily left behind. But he’s also performed with Blur, Monty Alexander, The Brand New Heavies, Jamiroquai, Pee Wee Ellis and Jean Toussaint. Most jazz musicians lend their expertise to other forms of popular music. All these elements, from reggae to sampling, may suggest to some that Rollins would be hard pushed to define in exactly what jazz consists these days. “It depends what perspective the composer is coming from”, he said. “Some composer/musicians may want to challenge the audience and may not what to play the game of what the audience wants to hear. But in all cases, it’s integrity and authenticity that are important. My approach to composition and audience inclusion changes constantly. As a performer, I may want to challenge audiences with the darkest and most sinister jazz and funk, which will have them wondering; only for me to follow with something ballad-like and beautiful. It’s all about emotion and understanding: the ugly and the beautiful can live in the same room”. The trio was a return to jazz with its funk element lessened somewhat, and drummer Pablo Segundo and organist Ross Stanley providing furnace heat and propulsion, allowing Rollins to open up on a range of styles and charts. It garnered some excellent reviews and enhanced the leader’s already high standing. He’s to be found these days playing Michael Rath trombones, with a turned-up bell in the Dizzy Gillespie manner (though the “bend” in Diz’s trumpet reputedly had its origin in accidental damage to the instrument). His gigs are decently spaced, what with all the other commitments. But is it a way of keeping sane? “To keep sane you’d be better off not being a jazz musician”, he said. “It’s a tough industry to navigate, with the challenges having nothing to do with the music. The music and the performance are the easy parts. Running a band in 2018 is a challenge. But it’s an indescribable feeling once you hit the stage and the band and all elements of the music you created are singing sweetly. There are no words to describe that”.